Mortgage Market Guide: Retail Sales Drop. Consumer Inflation Pops. Last Week in Review: August Retail Sales dropped while consumer inflation popped. Forecast for the Week: The Fed said …? Find out Wednesday. View: Choose a daily focus to fire up your business activity. “Never worry about the price of gas.” Luke Bryan. Retail Sales dropped in August while higher fuel prices revved up consumer inflation. Families may have pulled back on back-to-school shopping, but Hurricane Harvey played a role too. The Commerce Department reported that consumers pulled back on spending in August due in part to a drop in car sales attributed to Hurricane Harvey in southern Texas. 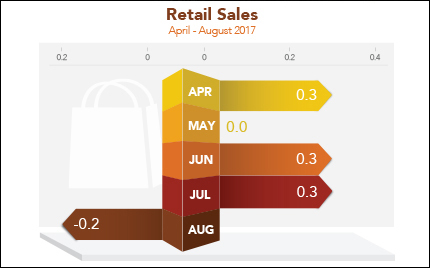 Retail Sales fell 0.2 percent versus the 0.1 percent increase expected, while July’s sales figures were revised lower to 0.3 percent from 0.6 percent. Retailers have been suffering a bit with in-store traffic, but sales at online retailers declined 1.1 percent in August too, the biggest drop since April 2014. On the inflation front, the Consumer Price Index (CPI) had its largest month-over-month increase in seven months, rising 0.4 percent from July to August. But one month does not make a trend; the increase was due in part to a spike in gasoline prices that posted the biggest jump since January. Core CPI, which excludes volatile energy and food prices, was in line with expectations at 0.2 percent. The Producer Price Index (PPI), which measures wholesale inflation, came in just below expectations in August. But on an annual basis, PPI rose 2.4 percent after increasing 1.9 percent in July. Any signs of ongoing inflationary pressure are bad for fixed investments, like Mortgage Bonds, so inflation is an important metric to watch. When Mortgage Bond prices worsen, the home loan rates tied to them can worsen as well. At this time, home loan rates remain near historic lows. Fed Chair Janet Yellen and the Fed‘s monetary policy statement will capture attention midweek. Housing Starts and Building Permits will be released on Tuesday, followed by Existing Home Sales on Wednesday. The Fed‘s monetary policy statement also will be released Wednesday, and it could be a market mover. Thursday brings weekly Initial Jobless Claims and regional manufacturing data in the Philadelphia Fed Index. As you can see in the chart below, Bonds have been trading in a sideways pattern after recent declines. Home loan rates are still near historic lows. If you want to increase your business, reduce your hours and make the most of your time, one simple technique is to implement a daily focus. Pick an hour or two each day and focus on a specific income-producing activity like those listed below. Adapt these actions to meet your specific product or service. Business Contact Monday. Reach out to contacts you’ve done business with recently or those you want to work with in the future. Try to schedule a 15-minute meeting over coffee to discuss their businesses, share some news or a helpful business tip, or answer any questions they may have in your field of expertise. Status Tuesday. Provide detailed status updates to clients in your sales pipeline, vendors and referral partners related to transactions. Also use this opportunity to ask for referrals at the end of the call. New Business Wednesday. Reach out to prospects to make sure all their questions are answered. If you discover they’ve found someone else to work with, offer your encouragement and support. If that relationship sours, they’ll think of you. It’s Been a While Thursday. Call past clients you haven’t heard from in a while just to say hello and see how they are doing. Remind them you are available to answer any questions that they (or people they know) may have. Gratitude Friday. Send a handwritten thank you note to a few of your best contacts. You can thank them for referrals, closing a recent transaction or just for being part of your success. A daily focus provides an easy way to ensure you do something to build your business each day. Give it a try!